A two year limited warranty is standard on all steel manufactured products. Accessories, where applicable, have the original manufacturers’ warranty. 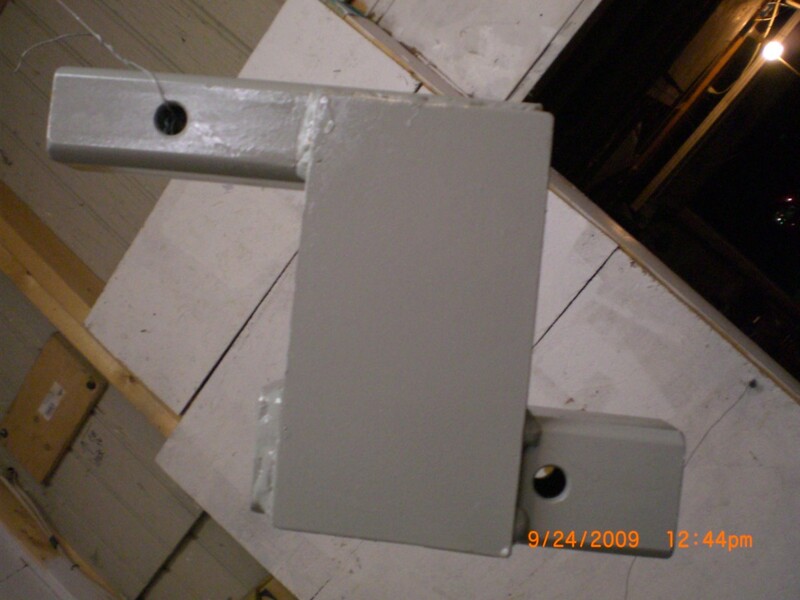 Powder Coat or Enamel Paint is not covered by the warranty. Most of these items are stock. Some items may be back ordered up to 2 weeks. Custom products generally take 3-4 weeks to manufacture and make available for shipment. A 40% minimum, non-refundable, down-payment is expected at the time the order is placed on custom orders. Smoke gray oil-based enamel paint over industrial primer is used a few products. Powder coated receiver assemblies, carrying trays and loading ramps are standard finish. Ask about the finish when requesting a quote. A minimum of (2) RED DOT pressure sensitive tape markers are included on all cycle carriers. US made, graded steel is used on all products unless otherwise noted. All fasteners are graded and heat treated. Please send inquiries including request for quotes on customs, pricing on standard products or dimension/sketches of the desired products to: saslavick@yahoo.com. Inquiries are generally answered within 1 or 2 days. Please include: “motorcycle make/model” and hauling vehicle year, make and model. Also, please tell me what size hitch is being used. 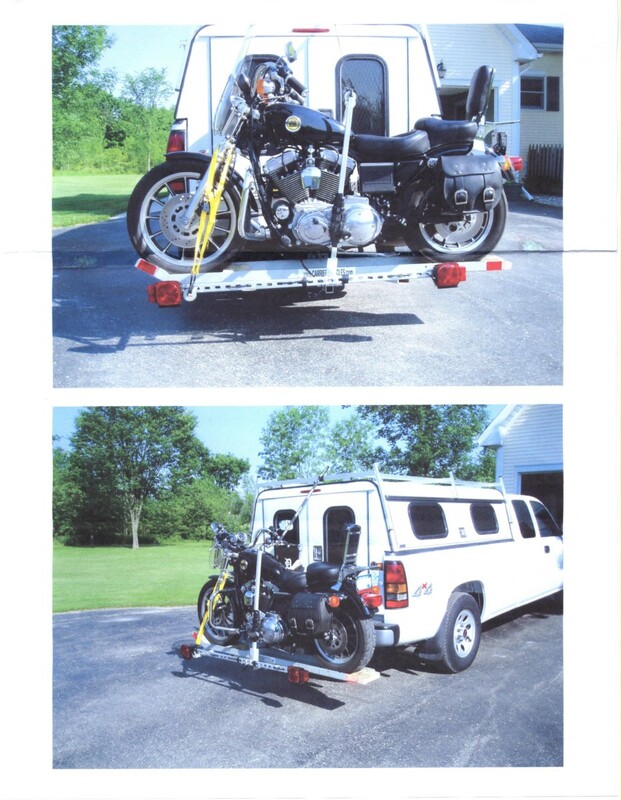 Photos of the cycle and rear of the hauling vehicle are very helpful. 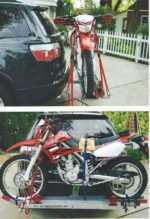 The best application info to provide is to photo the items together: show motorcycle placed on center behind the hauling vehicle and provide several decent photos of the entire rear, close ups AND a side view showing the hitch to vehicle bumper relationship! 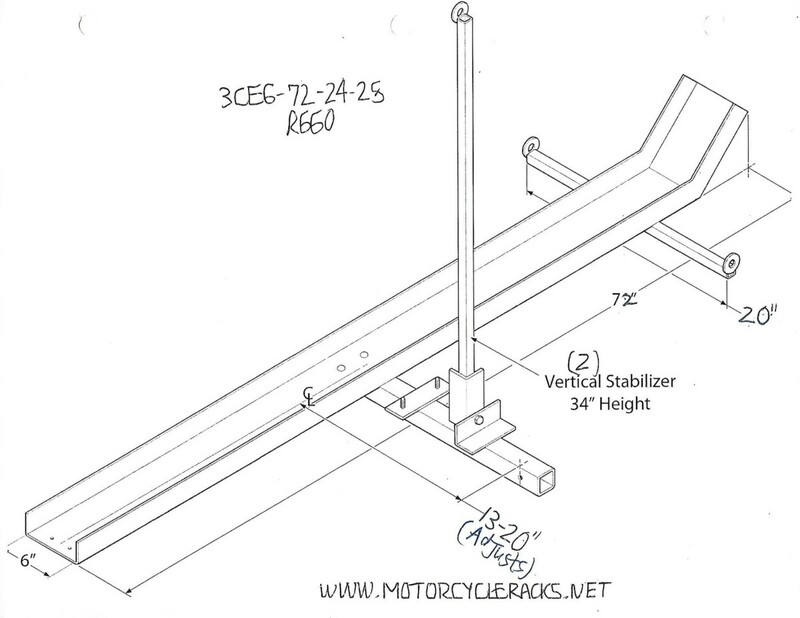 One or more vertical stabilizer bars are recommended for any cycle over 100 cc or 150 lbs. 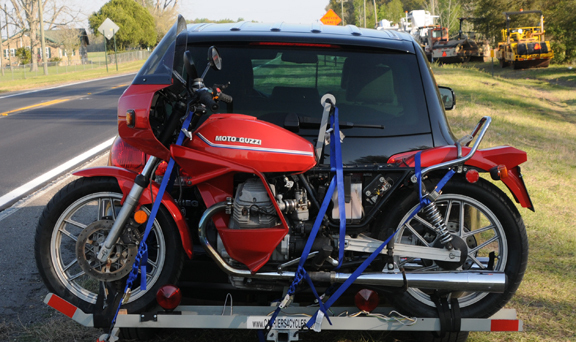 The vertical sta-bars prevent the sway action as the motorcycle is not inline with the hauling vehicle so different rules apply! 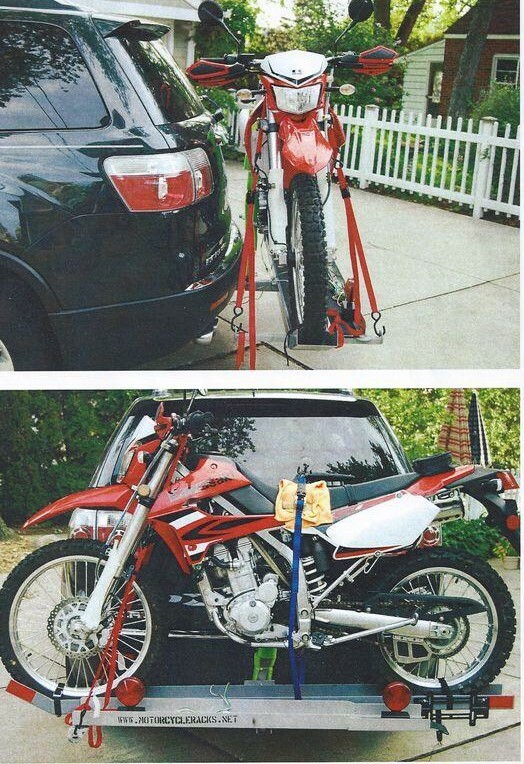 Three or more high quality tie downs with hook on the ends are required for securing the motorcycle. 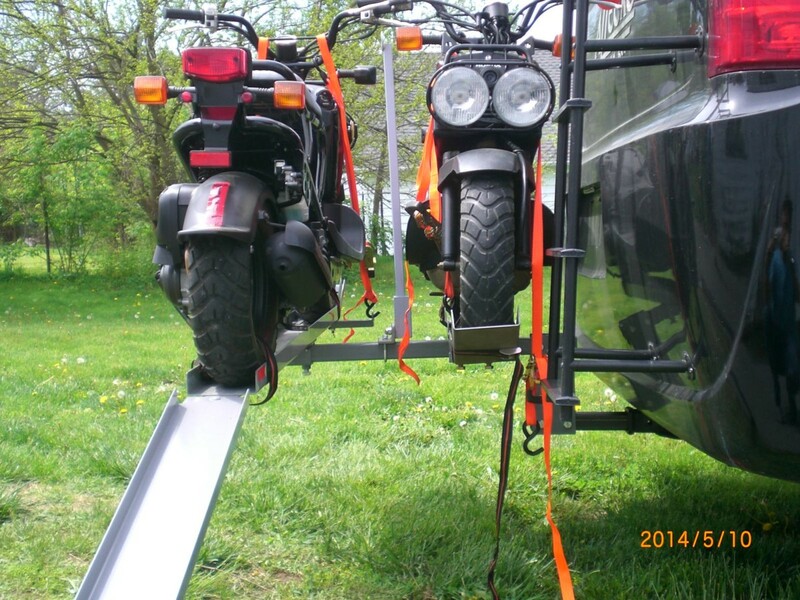 MotorcycleRacks will furnish lashing straps/cam- buckle style ties for securing each wheel to the tray. Bungee cords are not recommended! Class 3 or 4/2” hitch on your vehicle required. 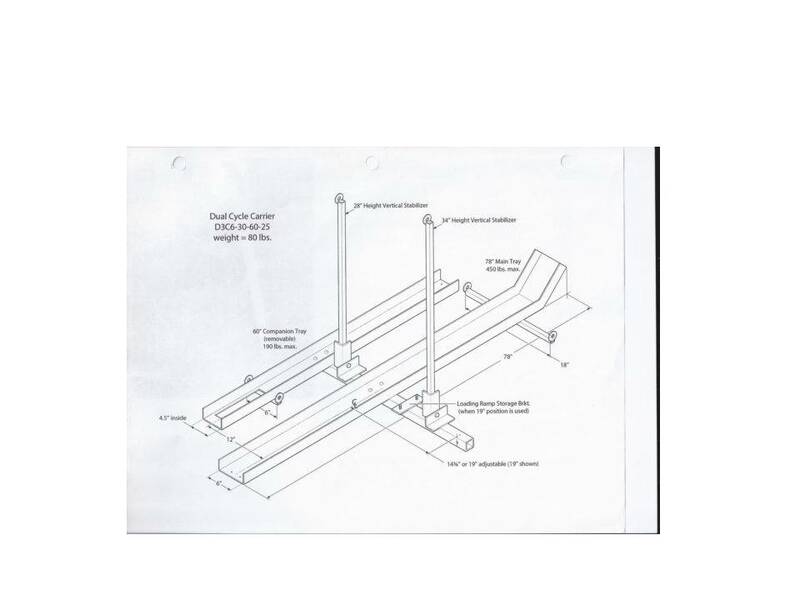 Carrier consists of a Receiver assembly(draw bar)2” square tubing with heavy wall thickness, mounting brackets with multiple locations and 1-1/2” detachable square tube steel side supports. 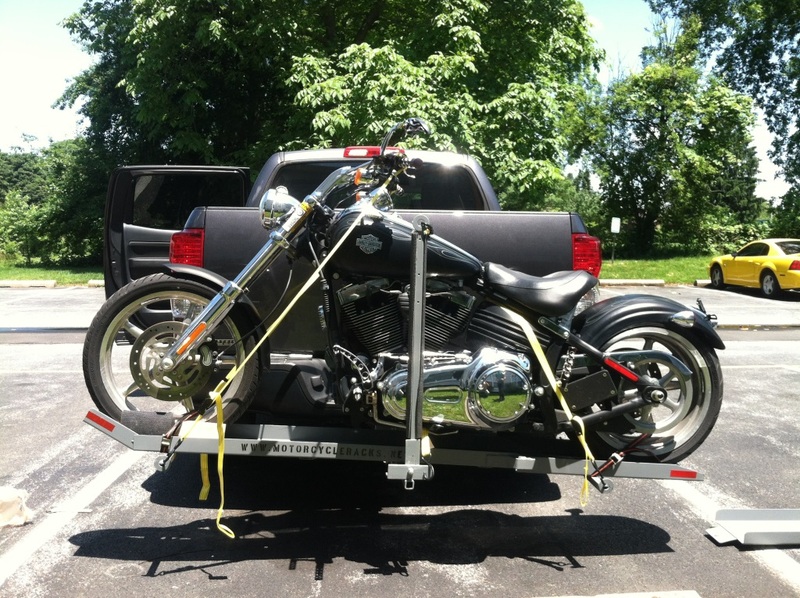 The main carrying tray is 11 gauge steel sheet, brake bent at 7” -8-1/4”wide in the front and rear x 84” long tray with detachable and adjustable bolt up features to accommodate a wide variety of road motorcycles. 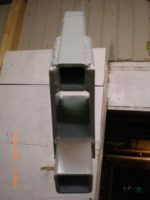 Included is an integrated anti-chock, no tilt device for a no rattle connection at the hitch connection. 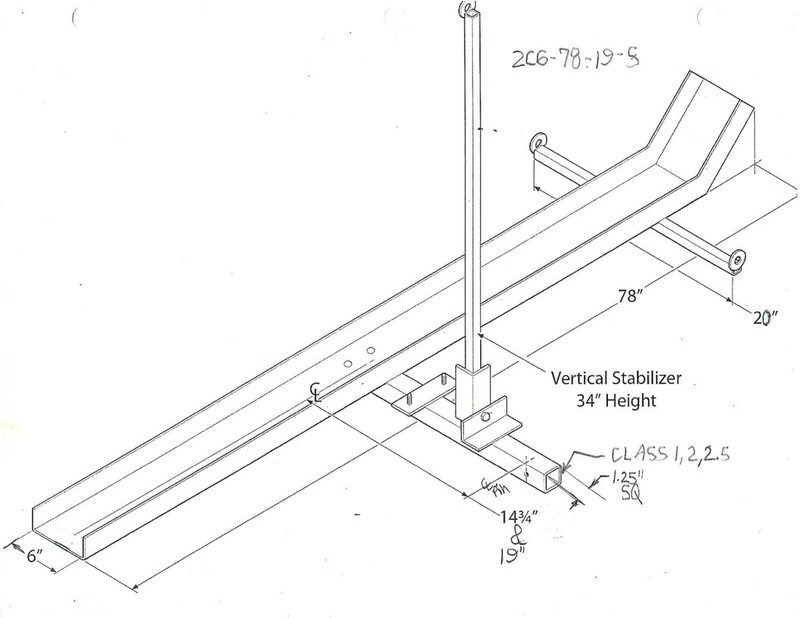 The center distance from the receiver pin to the carrying tray is selected at assembly of 14.75” or 19”. (other lengths avail.) The carrier can handle cycles with rear wheel widths up to 200mm or 8-3/4” wide and wheel end to end lengths of 88” long. Weight rating is 900 lbs during extended use. A front wheel chock, 1 horizontal stabilizer bar and two vertical sta-bars are included. 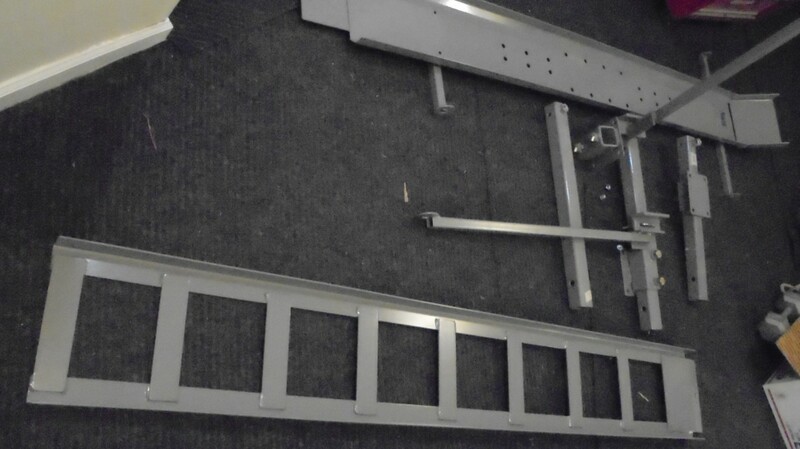 A 9-1/4” wide x 60” long loading ramp(does not store on the carrier as standard) and all hardware is included. Also included is a 2 year warranty and a pair of cam-lock straps to secure the wheels to the tray. This unit can be shipped Fedex or UPS ground in 2-4 business or picked up locally in suburban Hagerstown, MD Shipping rates can vary but generally start around $70. 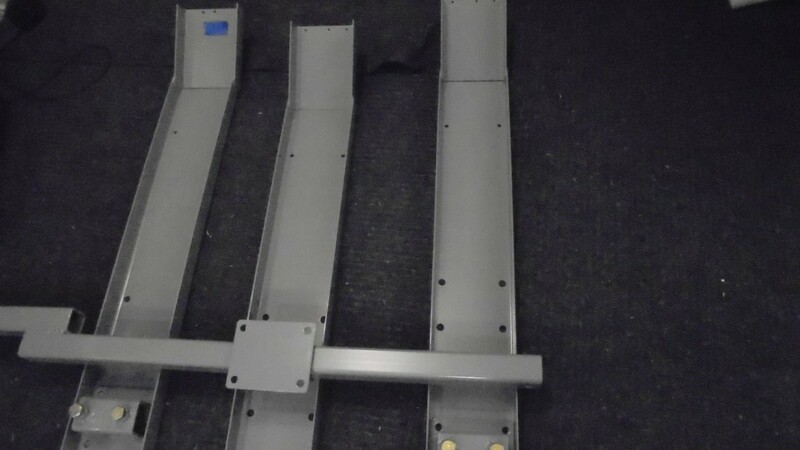 Standard Road Bike Carrier Model 3CD6-82-19-2S, R660 $485 (Perfect for HD Sportsters)Class 3 or 4/2” hitch on your vehicle required. 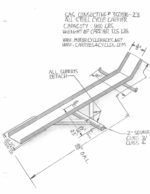 Carrier consists of a Receiver assembly(draw bar)2” square tubing with heavy wall thickness, mounting brackets with multiple locations and 1-1/2” detachable square tube steel side supports. 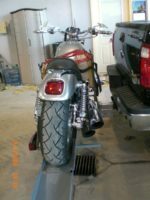 The main carrying tray is 11 gauge steel sheet, brake bent at 6″wide in the front and rear x 82” long tray with detachable and adjustable bolt up features to accommodate a wide variety of road motorcycles. Included is an integrated anti-chock, no tilt device for a no rattle connection at the hitch connection. The distance from the receiver pin to the carrying tray is selected at assembly of 14.75” or 19” The carrier can handle cycles with rear wheel widths up to 150 mm or 6” wide and wheel end to end lengths of 86” long. Weight rating is 900 lbs during extended use. A front wheel chock, 1 horizontal stabilizer bar and two vertical sta-bars are included. 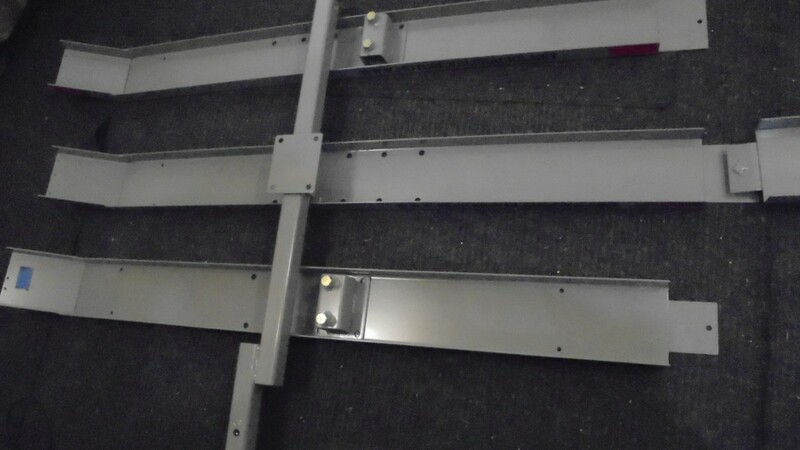 A 6” wide x 60” long loading ramp that stores on the carrier and all hardware is included. Also included is a 2 year warranty and a pair of cam-lock straps to secure the wheels to the tray. This unit can be shipped fedex ground in 2-4 business or picked up locally in suburban Hagerstown, MD Shipping rates can vary but generally start around $75. 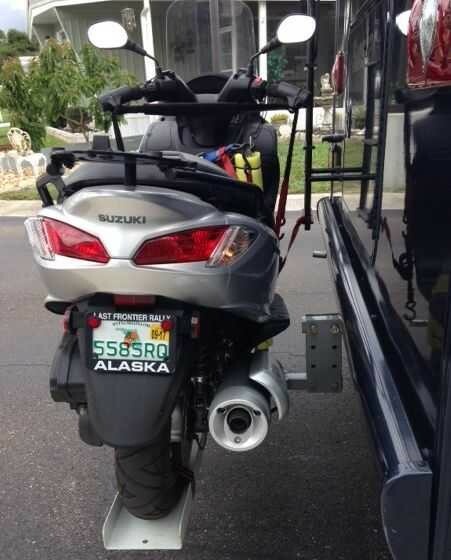 Class 3/2” hitch on your vehicle required. Carrier consists of a 2” square tubing with heavy wall thickness, 11 gauge brake bent 6” wide x 78” long tray, 4 bolts secure it to the receiver tube assembly with an integrated anti-chock device for a no rattle connection at the hitch. The distance from the receiver pin to the carrier tray is 14.75” or 19” (others avail. )depending on your selection of bolt pattern when assembling the unit. The carrier can handle cycles with wheel widths up to 150mm or 6” wide and wheel end to end lengths of 84” long. Weight rating is 560 lbs during extended use. A front wheel chock, 1 horizontal stabilizer bar and two vertical sta-bar is included. A 6” wide x 60” long loading ramp that stores on the carriers and all hardware is included. Also included is a 2 year warranty and a pair of cam-lock straps to secure the wheels to the tray. 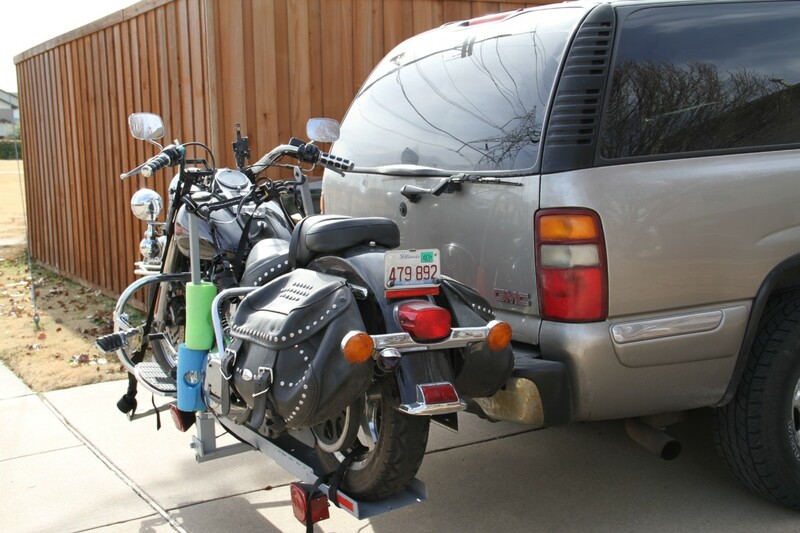 Small hitch motorcycle carrier Model 2C6-78-19-S R660 $330 plus freight Class 1,2/2.5; 1-1/4” square receiver hitch on your vehicle required. 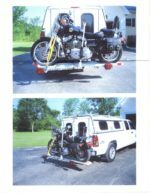 Carrier consists of a 1-1/4” square tubing with 1/8” wall thickness, 11 gauge brake bent 6” wide x 78” long tray 4 bolts secure it to the receiver tube assembly with an integrated anti-chock device for a no rattle connection at the hitch. The distance from the receiver pin to the carrier tray is 14.75” or 19” depending on your selection of bolt pattern when assembling the unit. The carrier can handle cycles with wheel widths up to 150mm or 6” wide and wheel end to end lengths of 84” long. Weight rating is 350 lbs during extended use. A front wheel chock, 1 horizontal stabilizer bar and one vertical sta-bar is included. 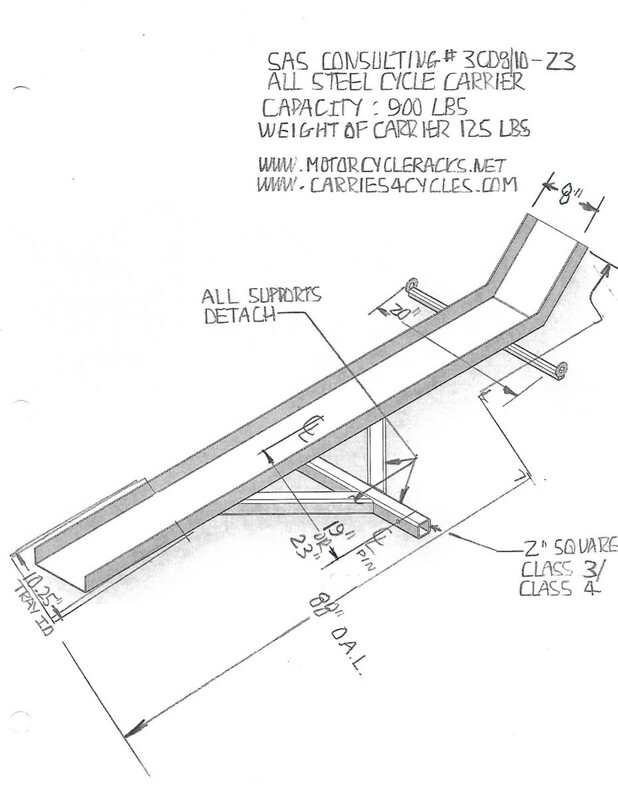 A 6” wide x 60” long loading ramp that stores on the carriers and all hardware is included. Also included is a 2 year warranty and a pair of cam-lock straps to secure the wheels to the tray. 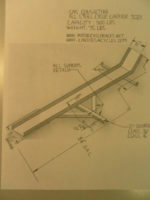 This unit can be shipped fedex ground in 2-4 business or picked up locally in Hagerstown, MD. Shipping rates can vary but generally start around $60. Class 3 or 4/2” hitch required on your vehicle. Carrier consists of a 2” square tubing receiver assembly with heavy wall thickness tubing with an integrated anti-chock device for a no rattle connection at the hitch, a sliding assembly welded to the 8” wide x 82” long tray that is adjustable from: 14” to 21” from the receiver pin to the center of the carrier tray. There is also adjustment of 4″ left to right on the tray for weight adjustment/balancing of the center of mass. 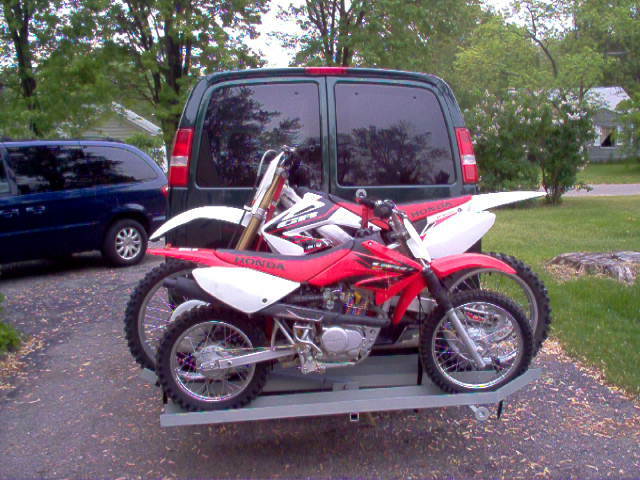 The carrier can handle motorcycles with rear tire widths up to 190mm and 83” in length, wheel end to end. Weight rating is 560 lbs max. during extended use. A front wheel chock, 1 horizontal stabilizer bar and two vertical sta-bars are included. 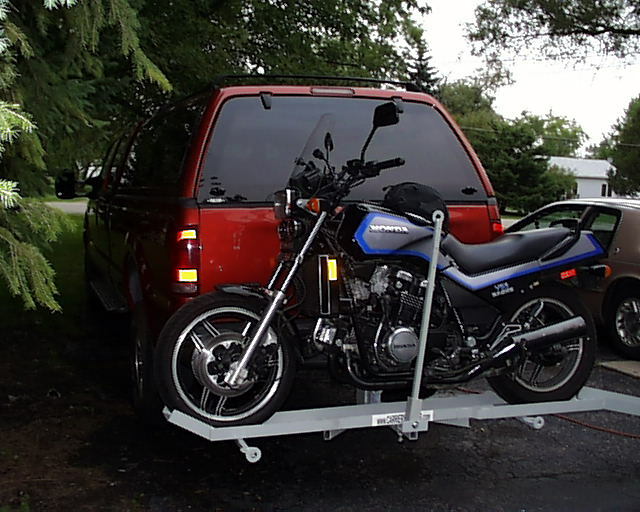 A 9-1/4” wide x 60” long loading ramp (may not store on the carrier)and all hardware is included. Also included is a 2 year warranty and a pair of cam-lock straps to secure the wheels to the tray. This unit can be shipped fedex ground in 2-4 business or picked up locally in Hagerstown, MD. Shipping rates can vary but generally start around $70. Min. Class 3 or 4/2” hitch on your vehicle required. 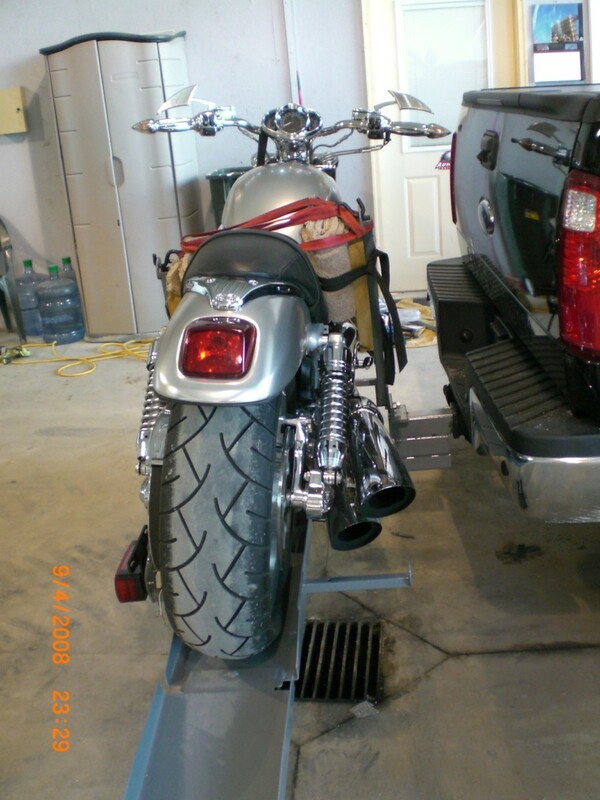 Carrier consists of a 2” square tubing with heavy wall thickness, and 1-1/2 ” detachable square tube steel side supports, 11 gauge brake bent at 8” wide in the front and 10″ rear x 88” long tray with detachable and adjustable bolt up features to accommodate a wide variety of road motorcycles. Included is an integrated anti-chock device for a no rattle connection at the hitch. 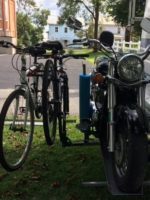 The distance from the receiver pin to the carrying tray is selected as assembly of 16.75 or 21” The carrier can handle cycles with rear wheel widths up to 240mm or 10” wide and wheel end to end lengths of 90” long. Weight rating is 900 lbs during extended use. A front wheel chock, 1 horizontal stabilizer bar and two vertical sta-bars are included. A 10” wide x 72” loading ramp and all hardware is included. Also included is a 2 year warranty and a pair of cam-lock straps to secure the wheels to the tray. 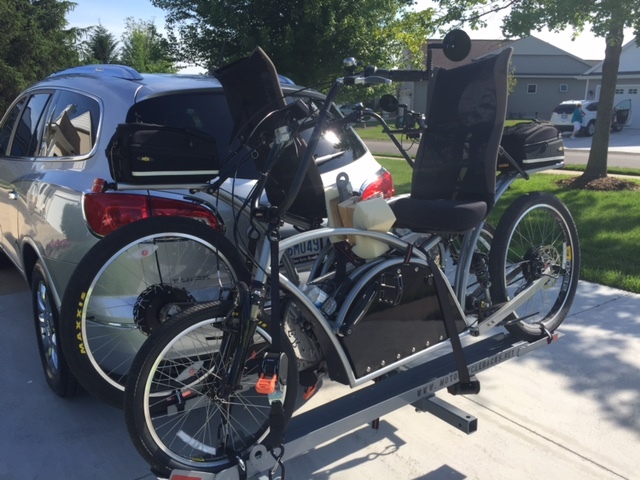 Note the loading ramp may not be readily stored on the cycle carrier itself. 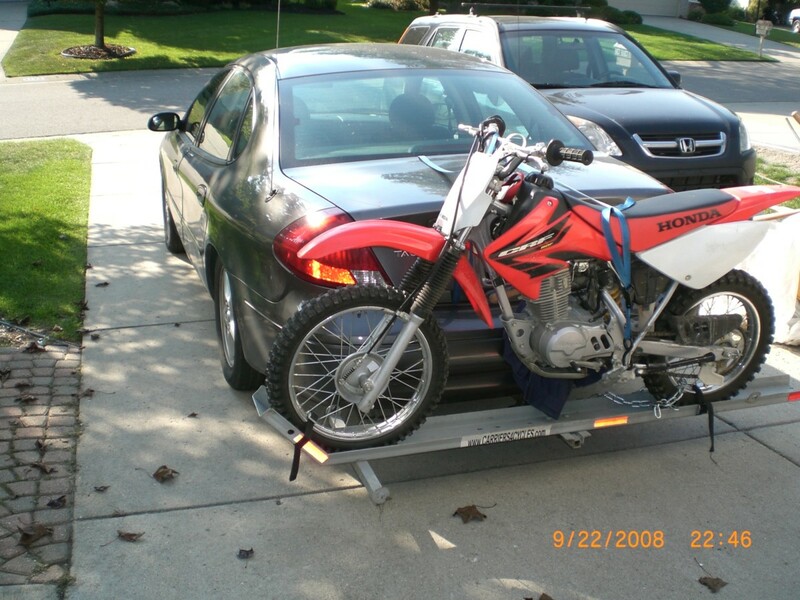 An optional kit for storing the loading ramp underneath the carrier is available, if ground clearance is adequate. Ask SAS to quote this option. This unit can be shipped fedex ground in 2-4 business or picked up locally in Hagerstown, MD. Shipping rates can vary but generally start around $110. This scooter carrier is rated for 600 lbs and has adjustable tray location front to back and left to right to accommodate the scooters listed above and is reversible for loading orientation. 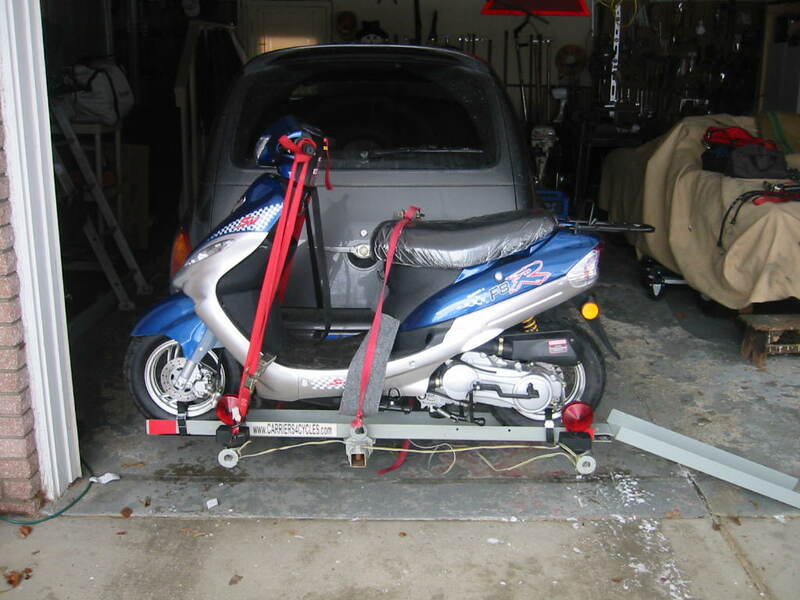 The receiver/draw-bar will be customized to fit your vehicle so your application has adequate loading height and is equipped with 3 loading ramps 6″ wide x 60″ long(only one shown) THE LOADING RAMPS STORE ON THE SCOOTER CARRIER. (UNLIKE THE VERSA-HAUL VERSION WHICH REQUIRES LOOSE CARRYING OF THE 3 LOADING RAMPS IN THE HAULING VEHICLE) There is an integrated anti-tilt/no slop connection feature at the hitch connection which is guaranteed to eliminate the side to side rattle. All hardware and tie down points are included. 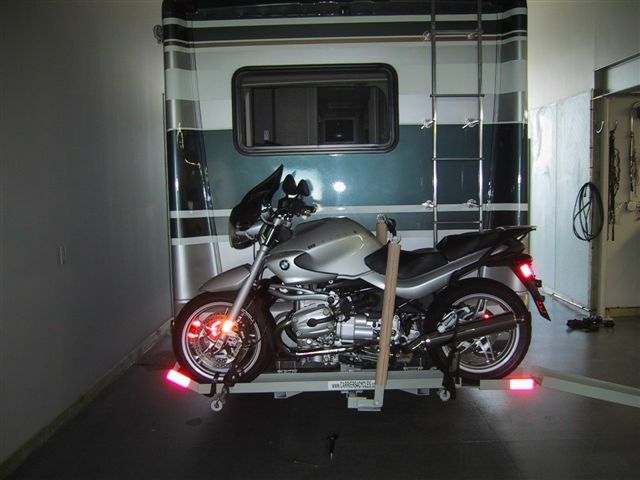 This unit handles scooter wheel end to wheel end lengths of 77″ and scooter overall wheel widths of 34″ THIS UNIT CANNOT MOUNT ON 5TH WHEELS/TRAVEL TRAILER BUMPERS. YOU NEED A TRUCK OR HEAVY SUV! This unit may be back ordered 1-3 weeks. I will need dimension from your truck or hauling vehicle to customize the receiver assembly if required! Class 3 /2” hitch required on your vehicle. Carrier consists of a 2” square tubing receiver assembly with 3/16” wall thickness tubing with an integrated anti-chock device for a no rattle connection at the hitch, a sliding assembly welded to the 6” wide x 72” long tray that is adjustable from: 13” to 22” from the receiver pin to the center of the carrier tray. The carrying tray also is adjustable up to 4″ left to right for proper balancing of the rear weight biased scooter out there. The carrier can handle scooters with rear tire widths up to 150mm and 76” in length, wheel end to end. Weight rating is 560 lbs maximum. 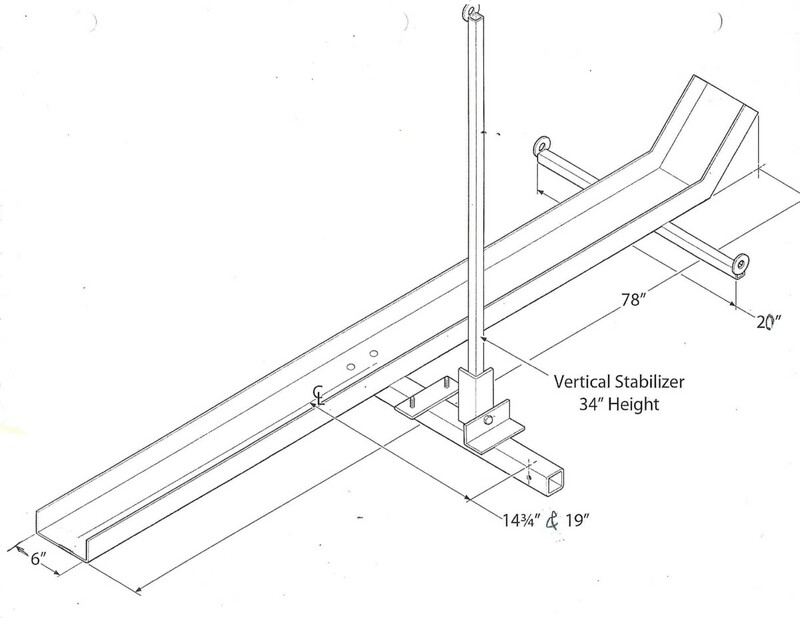 One vertical sta-bar is included. A 6” wide x 60” long loading ramp that stores on the carriers and all hardware is included. Also included is a 2 year warranty and a pair of cam-lock straps to secure the wheels to the tray. This unit can be shipped fedex ground in 2-4 business or picked up locally in Hagerstown, MD. Shipping rates can vary but generally start around $60. 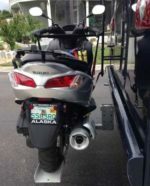 Class 3 /2” hitch required on your vehicle. Carrier consists of a 2” square tubing receiver assembly with 3/16” wall thickness tubing with an integrated anti-chock device for a no rattle connection at the hitch, welded receiver assembly with a detachable 4.5” wide x 60” long tray with front wheel slot that and a distance from the receiver pin to the center of the carrier tray of 12, 16.75 & 21.5. 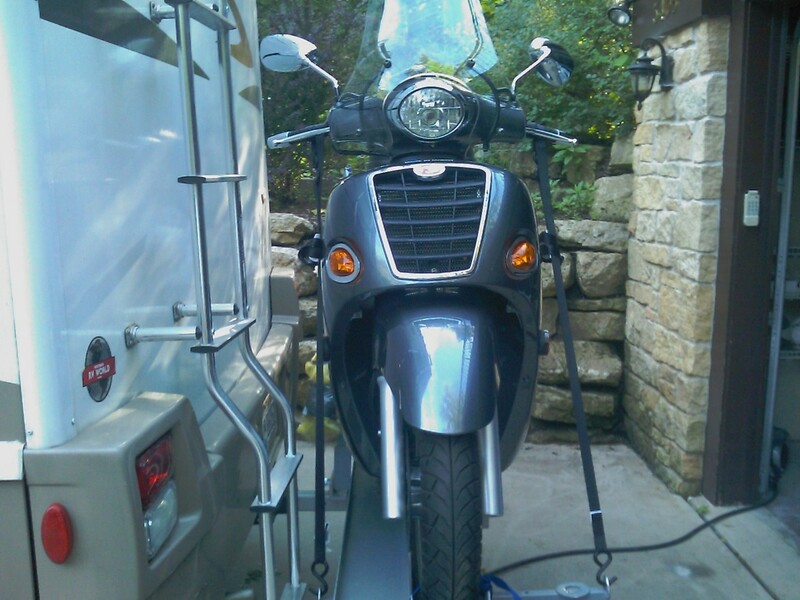 The carrier can handle motorcycles with rear tire widths up to 110 mm/4.4” and 64” in length, wheel end to end. (It will not work on any of the new Vespas which have a 120mm wide rear tire) Weight rating is 300 lbs maximum. Consult SAS directly or see the application chart on the website. 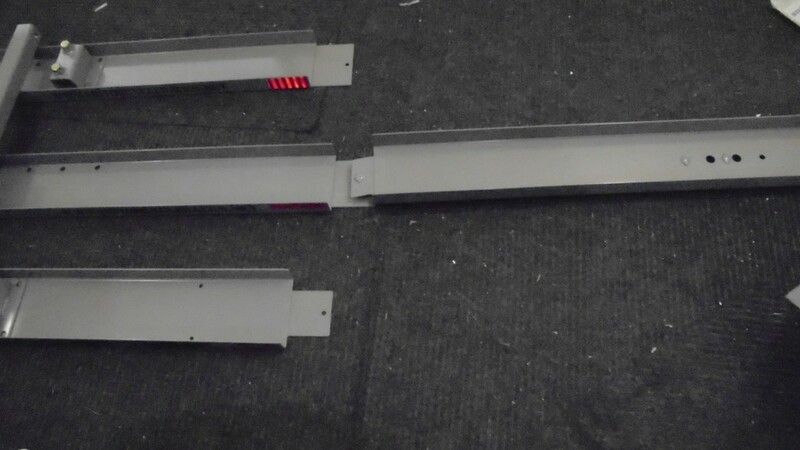 A front wheel slot, 1 horizontal stabilizer, 4.5” wide x 60” long loading ramp that stores on the carriers and all hardware is included. Also included is a 2 year warranty and a pair of cam-lock straps to secure the wheels to the tray. This unit is not in stock and is back ordered 2-3 weeks. This unit can be shipped fedex ground in 2-3 business or picked up locally in Hagerstown, MD, Shipping rates can vary but generally start around $45. Class 2 /1.25” hitch required on your vehicle. Carrier consists of a 1-1/4” square tubing receiver with an integrated anti-chock device for a no rattle connection at the hitch, welded receiver assembly with a detachable 4.5” wide x 60” long tray with front wheel slot that and a distance from the receiver pin to the center of the carrier tray of 12, 16.75 & 21.5. 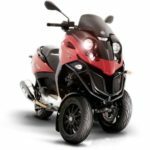 The carrier can handle motorcycles with rear tire widths up to 110 mm/4.4” and 64” in length, wheel end to end. (Will not work on the newer Vespas which have 120mm wide rear) Weight rating is 300 lbs maximum. Consult SAS directly or see the application chart on the website. A front wheel slot, 1 horizontal stabilizer, 4.5” wide x 60” long loading ramp that stores on the carriers and all hardware is included. Also included is a 2 year warranty and a pair of cam-lock straps to secure the wheels to the tray. This unit is not in stock, 2-3 week lead-time. It can be shipped fedex ground in 2-3 business or picked up locally in Hagerstown, MD. Shipping rates can vary but generally start around $40. Most receivers can be ordered special to adapt to a lowering or raising kit allowing added ground clearance or facilitate easier loading by lowering the carrying tray. This kit is offered in 3″ increments and up to 6″ max. The kits generally start at $75 as an add on to certain products and generally adds 3″ to the hitch pin to center of tray dimension. Request a quote or feasibility check. The ideal loading height is 13-18″ from ground to center of hitch for most situations! Class 3 or Class 2 Receiver hitch may be added to “C”style/”CD” style and “CE” style products respectively by adding the suffix RH(Class 1 or 2, 1.25″ square) or RH3(Class 3 or 4, 2″ square) starting at $45. A bolt on Class 3 hitch kit is also available on C or CD style receivers. 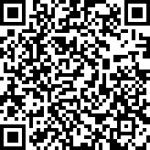 Request a firm quote and availability. Generally, they are in stock and start at $45. 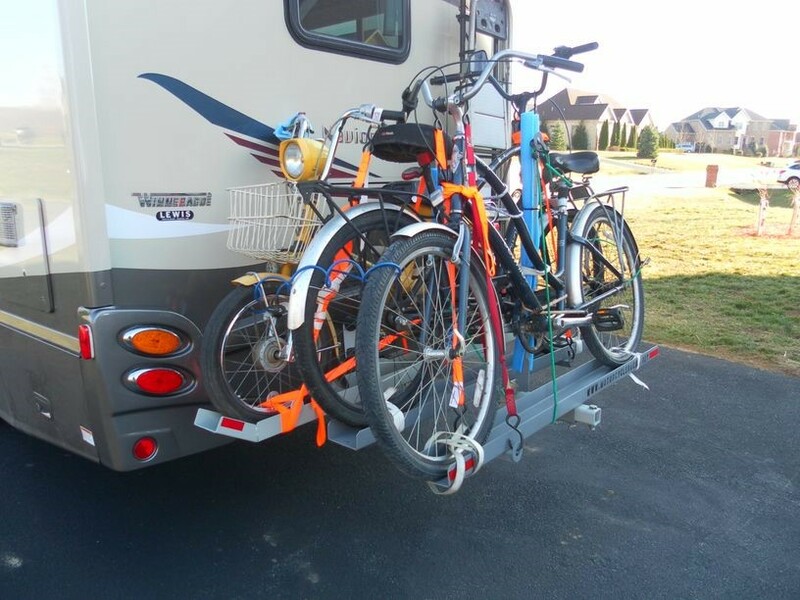 For Motor-homes or other vehicles where the existing single hitch may not be sufficient for the weight, we offer a 3 receiver design. On this design, you provide an additional left and right hitch and I supply the complete carrier with (3) receiver tubes and all required bracketry. Buyer spots 8 holes in the carrying tray at assembly to fit the carrying tray. From: $665 plus freight. Insert the value of 24 or 28 into the part number. The number used is the maximum and subtract 4″ for the closer value. Example 3CD7-28-2S has center of hitch pin to center of carrying tray values of 28″ or 24″. This selection is made when assembling the carrier. Again, it is ordered by specifying the 28″ ;The 24″ is automatically the default lower value of the bracketry that will be ordered. DUAL MOTORCYCLE, SCOOTER AND ELECTRIC BIKE CARRIERS: Several different dual carriers up to 600 lb capacity are available for 2 full size dirt bikes or one larger cycle/dual sport bike and (1) smaller dirt bike up to 175 lbs. 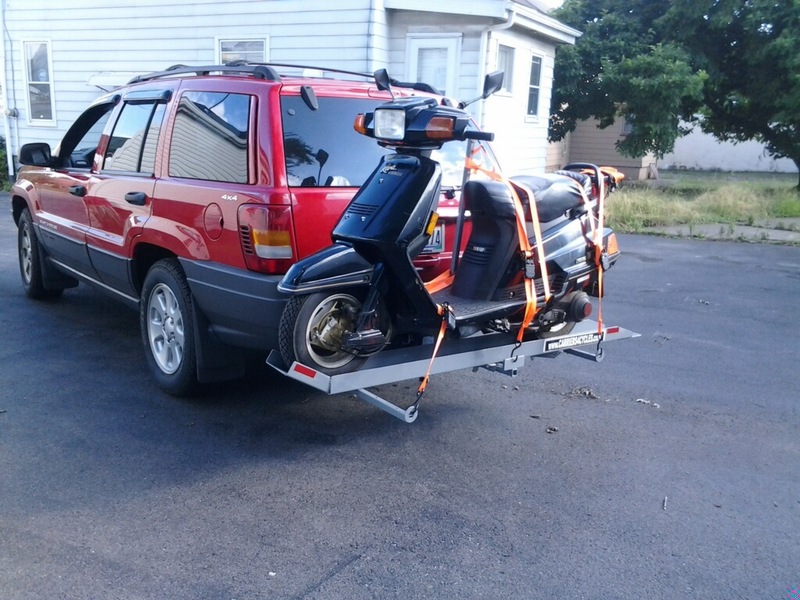 Also, dual scooter carriers for scooters with narrow tires and wheel end to end length up to 64″, 230 lbs each. These units are typically not in stock and are back ordered 2-3 weeks. OTHER CUSTOMS I.E. COMBO MOTORCYCLES/ELECTRIC BIKES, 3 RAIL CARRIERS: W/ONE LARGE BIKE & SMALLER BIKES. Contact SAS for a quote and application assistance. These units are typically not in stock and are back ordered 2-3 weeks. Others available & quoted upon request! NOTE: All carriers have the integrated Anti-wobble/Anti-tilt feature built into the receiver. This feature is guaranteed to eliminate the side-to-side slop in the receiver attachment. Cam style tie down/lashing strap for securing wheels to the carrier tray: $7/pair. Soft Tie/No mark loop connectors for tying to fork, frame or handlebars: $9/ pair. 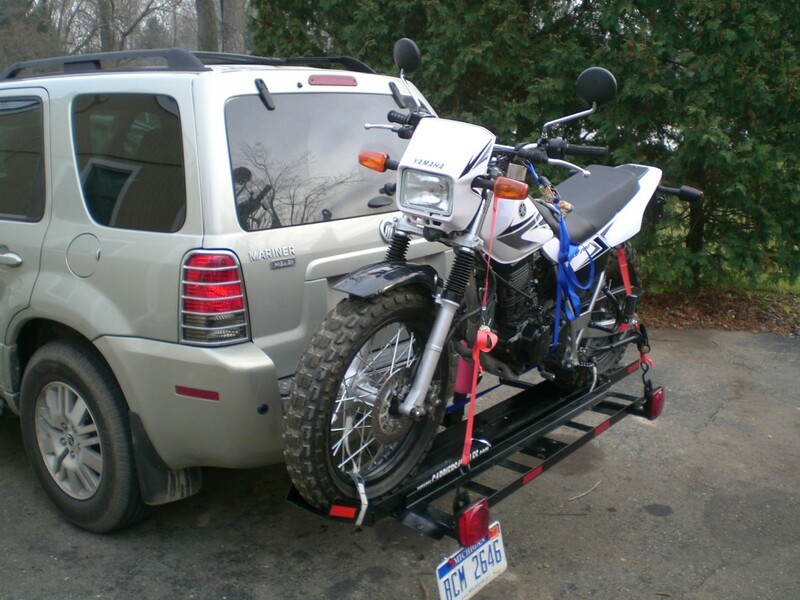 Slide the ladder or steel bar/pipe through this ladder rack (goal posts)and onto the vehicle roof rack or inside without damaging the paint on the SUV, Van or Truck. This rack is made to order. Can be class 2 or 3 hitch x 60″ long vertical with “goal post” at the top for retaining and tying down ladder or other long accessories: starting price $140. Call or email for dimensions. 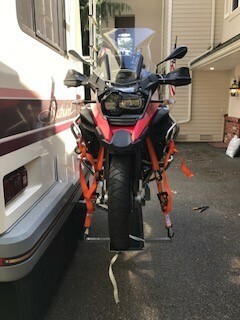 Towing bar for vehicle w/ a class 3 hitch.